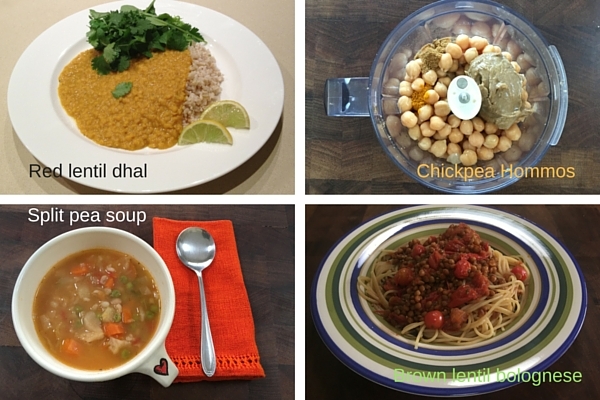 Last week I explored the numerous benefits of eating pulses—legumes and lentils. And this week I am sharing a few of my tips to make cooking with pulses simple and enjoyable. Pulses have been an important food and protein source across the world, from America to Europe, Africa and Asia. They are prominent in the traditional cuisines of the Mediterranean, Middle East, China, Nepal, India, Japan, Africa and Central and South America. Bean Curd (Tofu) Made from soya beans it has a soft to firm texture and bland flavour. Herbs and spices are used to add flavour to a soup, stir-fry or curry. Dates back to Han Dynasty 206BC – AD220. Asian cuisine. Black-eyed bean Small creamy kidney shaped bean with a black or yellow “eye”. When cooked it has a sweet flavour. Used in bean soups, curries and salads and bean fritters. From tropical Africa and Asia. Features in Central African, Indian, Greek and Middle Eastern cuisines. Borlotti Bean Speckled coloured bean – beige with darker brown markings. Very popular in Italy—soups, stews, casseroles and salad. From tropical America and introduced to Europe by Spaniards in early 1500s. Chickpea Round beige coloured pea with a small peak on one side. It has a nutty flavour once cooked. Dry roasted as a snack with spices, pureed to make hommos, Dhal curry, soups, stews, casseroles and salads. Chickpea flour (Besan) is also used in cooking. Native to west Asia. Popular in Middle East, Spain, France and India. Lentil Varies in colour from green to brown, black and orange-red. Bland in flavour. Used in soups, purees, casseroles and Dhal curry. Also used for lentil burgers and in salads. Is thought to have originated in southwest Europe and temperate regions of Asia—dates back to 6750BC. The red lentil is the oldest variety. Mung Bean Mossy green in colour. Split beans are more creamy coloured. Mung Beans are most often used for sprouting. Native to tropical Asia—grown in India and China. In India the split bean I used for moong dhal and in China the whole bean is used for sprouting. Red Kidney Bean Kidney shaped been shaded pink to deep red-brown. Mildly sweet once cooked. Native American bean. Widely used in Mexico. Cooked in soups, casseroles, purees, re-fried beans and added to salads. Soya Bean Small oval bean about the size of a green pea. Can be cream, red or black in colour. Requires a long cooking time. Used in soups, stews, casseroles, salads and it is also sprouted. Originated in tropical areas of Africa and Asia. One of the ‘five ancient grains’ of China. Popular in Japan where it is usually cooked whole or made into bean curd. It is also fermented e.g. miso and tempeh. You don’t necessarily have to adopt Traditional recipes to enjoy the health benefits of legumes. As you can see above, they are ideal ingredients in soups, casseroles, curries and salads. Most of them have a neutral flavour, so they are not going to alter the flavour of your favourite meals. Pulses are also a great meat extenders or replacement in meals such as Spaghetti Bolognese. You can reduce the amount of minced meat and replace it with brown lentils. Or you might to try my Lentil Bolognese. Most legumes can be used to make burgers. Again you can use a combination of meat plus pulses, or you can use just the lentils or beans. Cooking with pulses is easy once you have a few recipes that work well for you. Soaking legumes overnight is not a hassle; you just have to remember to do it. This is why I think lentils and split peas are great because they don’t need soaking and have a short cooking time. If you seriously want to cook with beans, then I can highly recommend a pressure cooker. Cooking with pulses in a pressure cooker eliminates the need to soak and reduces cooking time to less than 30 minutes, depending on the type of bean. Canned lentils and beans are also an option. These are more expensive than dried pulses and you have to watch for added salt. You may also be concerned about the plastic lining of cans due to the Bisphenol A (PBA) content. Health concerns have been raised due to the PBA content—information is available on the Food Standards Australia New Zealand website. PBA free canned foods are now available. Beans and whole peas require overnight soaking. Lentils and spilt peas do not require soaking. A pressure cooker removes the requirement to soak beans and peas, and reduces cooking time. Cooked pulses can be frozen in portion size packs. The addition of bicarbonate of soda (to speed up cooking) reduces the B vitamin content, so this is not recommended. The addition of salt and/ or acidic ingredients such as citrus juice, vinegar, tomatoes and wine, lengthens the cooking time. Overnight soaking and the discarding of the water, that the pulses were soaked in, helps to reduce raffinose and stachyose—two carbohydrates broken down in the large bowel—that can cause bloating and wind. Additional cooking tips can be found on the Grain and Legume Nutrition Council website. I also highly recommend the Oxfam Vegetarian Cookbook featuring a number of pulse recipes. Cooking with pulses adds variety and health benefits to your meals. Pulses also reduce the cost of food by decreasing the quantity of meat consumed. If you are new to pulses, then I recommend that you introduce them slowly. This helps your digestive system adapt. Our monthly e-newsletter, Nourishment, provides practical information and tips. You can join here.